BOCA RATON, Fla.--(BUSINESS WIRE)--SurGenTec®, a minimally invasive orthobiologics company, has announced that the United States Patent and Trademark Office has granted a new patent for its bone graft delivery technology. The proprietary GRAFTGUN® delivery system enables surgeons to deliver the bone graft of their choice (synthetic, allograft, or autograft) in a minimally invasive fashion. Traditionally, surgeons have used a metal funnel and tamp to place bone graft; these surgeons have sought a solution to overcome the difficulties and dangers with this technique. The GRAFTGUN provides a simple, safe and ergonomic solution to deliver bone graft in hard to reach places. 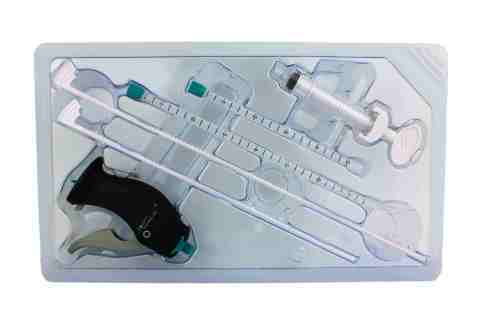 The GRAFTGUN kit includes a loading device and multiple tube sizes to support a variety of surgical procedures and patient sizes. The tubes have embedded radiopaque markers which enable the surgeon to visualize where their bone graft is being placed on fluoroscopy. The ratcheting technology provides the force necessary to extrude the majority of bone grafts on the market. SurGenTec develops minimally invasive surgical technologies to help surgeons provide optimal care for their patients. SurGenTec believes the GRAFTGUN will be an asset to surgeons in both spine and orthopedic procedures. SurGenTec also has several up-and-coming technologies that will be rolled out over the course of this year. SurGenTec, a privately owned medical device company based out of Boca Raton, FL, plans to release the GRAFTGUN this summer.